Saturday November 24th 1900 I did up morning work, wrote a letter to Mother. The boys finished the corn east of the road and Will put the stock in. The boys went home. I was busy with house-work all day. I had a letter from Mother and note from Fannie Sunday November 25th 1900 I was busy about the work most of the forenoon and went down to Callies a few moments after dinner. I wrote a long letter to Verne in the evening. Monday November 26th 1900 I washed alone and had it done by noon. Will killed a hog in the morning and was up to Stevens in the afternoon. I was busy in the kitchen. 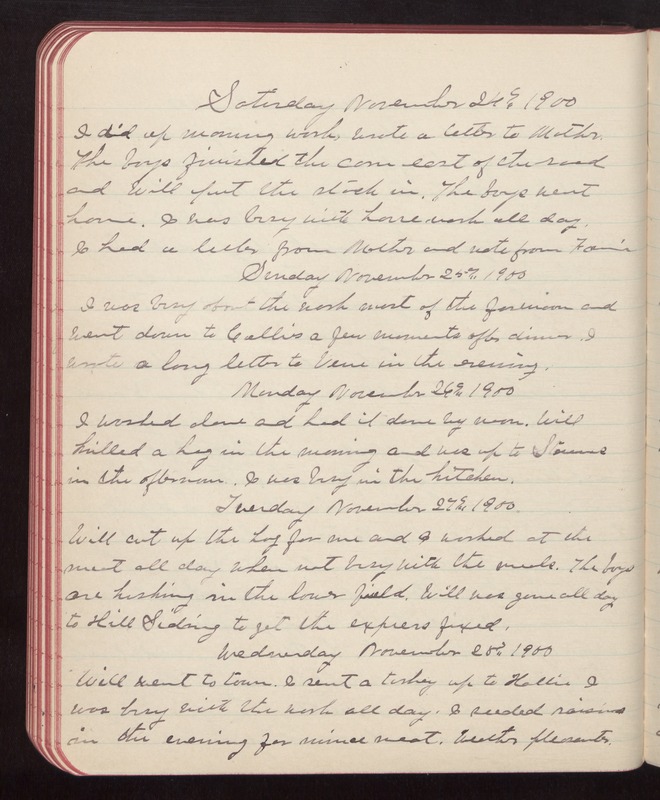 Tuesday November 27th 1900 Will cut up the hog for me and I worked at the meat all day when not busy with the meals. The boys are husking in the lower field. Will was gone all day to Hill Siding to get the express fixed. Wednesday November 28th 1900 Will went to town. I sent a turkey up to Hattie I was busy with the work all day. I seeded raisins in the evening for mince meat. Weather pleasanter.